Like it or not, technology is a major part of our lives now, more so than it ever has been at any other point in human history. With this increased dependency on computers, we’ve seen so many things change at a really staggering rate. To be honest, I’ve never really given much thought to the possibility of technology affecting tattoo in any particular significant way. There doesn’t seem to be that much that it could really offer, and furthermore, most tattooists are very protective of the traditional methods for creating their art. Based on these truths alone, I’ve always kept tattoo and technology somewhat separate in my mind. Oh but how unpredictable is this little dance called life. It seems that a group of smarty pants students at Paris design school ENSCI les Ateliers have set their sights on plain, old fashioned tattoo as being badly in need of some hi-teching up. In order to do this, they took a 3D printer and altered it with a tattoo machine. 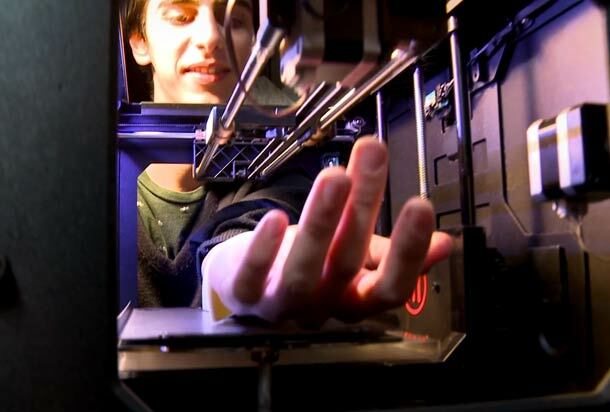 The end result is a 3D printer that can accept any image and tattoo it directly on to a person’s skin. So how does this make you feel, dear reader? Personally, I think the idea is kind of interesting, but I can’t really see the practical applications for it. The article itself fails to elucidate on what exactly is the greater goal of this device. Do they honestly believe that it will create an alternative to being directly tattooed by a human being? Or are they hoping that this will eventually be accepted by tattooists as a tool in their arsenal? If it’s the latter, I can’t envisage any future scenario where I would be more interested in getting tattooed by a tattooist who feeds the design into a printer than by the hand of the tattooist themselves. That being said, maybe that is exactly what the future of tattoo will hold. I’m doubtful that this will be the case, but how the hell do I really know? Twenty years ago I never would have thought people would prefer Kindles to reading actual books. Things change, people change. Until that happens however, I’m content to not really worry about technology encroaching into tattoo. The machines may be setting their sights on taking over, but they haven’t completely done it yet.